Major League Baseball will not be instituting any significant rule changes for the 2017 season, and that does not make commissioner Rob Manfred a happy camper. Earlier this month, there were reports that the league had proposed several rule changes, including ones that would impact the strike zone and intentional walk process. However, on Tuesday, Manfred announced there would be “no meaningful change” to the rules for the 2017 season, as the MLB Players Association did not agree to the proposed changes. 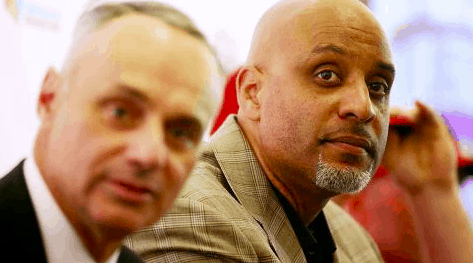 Nevertheless, Manfred went on to say that “our game has changed and continues to change,” and that he wants to continue to work with the players union to make alterations to the rules he feels are necessary for the health of the game. The commissioner declined to name the specific rules he’s determined to implement. However, in the past, Manfred has been outspoken about several rules that would help to increase the pace of play and create more action during games. In addition to altering the strike zone, a pitch clock has long been floated as a way to speed up the game. A 20-second pitch clock has been used in double-A and triple-A the past two seasons. Manfred has also mentioned the possibility of limiting visits to the mound and putting a cap on the number of pitching changes a team can make in a single inning. Tony Clark, executive director of the MLBPA, also spoke Tuesday, reiterating his stance against making radical rule changes. He says it’s too late to implement any drastic rule changes before the start of the 2017 season, especially with regard to altering the strike zone. However, even if Manfred can’t make any rules changes in time for 2017, the players union may not be able to stop him from doing so for the 2018 season. According to the current labor agreement, the owners can make rule changes without the players union agreeing to them as long as one year notice is given. Of course, it should be noted that the labor agreement agreed to earlier this winter has not yet officially been put into place. Manfred said Tuesday that he wants to continue to speak with Clark and the MLBPA in hopes of agreeing on changes. Nevertheless, Manfred and the owners making unilateral changes for the 2018 season can’t be ruled out. As it stands now, no significant rule changes will be made for the 2017 season, although minor tweaks, including the intentional walk change, may be possible. However, Manfred remains determination to institute rule changes designed to speed up the game. Those changes won’t happen in time for this season, but meaningful changes prior to the 2018 season are a distinct possibility.